Early childhood education plays a vital role in your children’s growth. 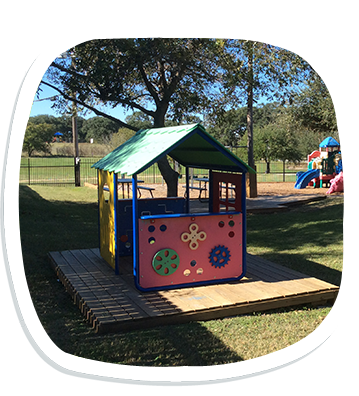 The early childhood education curriculum offered at Kid’s Academy in Buda, TX places emphasis on developing the children’s innate intelligence and skills through fun and interactive learning programs. Theme-based activities that aim to stimulate the students’ young minds are conducted per classroom and teachers work with each child, both academically and socially, to help them prepare for a higher level of learning. Committed to providing the best early childhood education to our students, our child development center offers child-friendly amenities that allow children to play and have fun as they discover new things. Our buildings offer open floor plans with large windows for our students’ comfort. We also have 3 spacious, age-specific outdoor playgrounds as well as a large playroom which children can use on rainy days. Our programs are designed to embrace all facets of your child’s developmental needs, emotional, social, physical, and intellectual. Activities will be planned to stimulate growth in all areas. Our curriculum is arranged in themes that tie together all activities to other meaning and connection. The children’s schedule will be a balance of individual and group learning situations. Teacher will use group time as an opportunity to facilitate specific learning in relation to theme and manipulate it, as needed, to foster understanding. At all times, the teachers will seek opportunities to address the individual learning needs of your child and provide a developmental plan that will set goals to challenge your child’s personal growth. Kid’s Academy offers full-time and part-time enrollment options. Children enrolled part-time have a 2- or 3-day option and are required to attend the same 2 or 3 days each week. Nutritious, hot lunches as well as morning and afternoon snacks are also included in the children’s weekly tuition. *Drop-In Rates Only. Space Not Guaranteed. If you wish to learn more about our early childhood education curriculum and the learning programs available at our center, feel free to get in touch with our representatives. They will provide you with all the information you may need. You may also reach us for inquiries regarding our child care employment opportunities. Call us today!